Is the book an attempt to reverse the trend for exporting Western (and increasingly US) ideas about mental health to the rest of the world? Emotional and psychological distress varies with cultural context. This book is about raising awareness of the challenges and opportunities that exist in sharing knowledge about that; and reflecting on the role that social sciences and humanities can play in understanding and addressing these difficulties. In the West, the ‘biopsychosocial model’ has tended to dominate the development and delivery of mental health services. Yet in other parts of the world its relevance for understanding emotional and psychological distress may be less clear or meaningful to people. This has been recognised for many years: Ethan Watters’ 2010 book Crazy Like Us presents a range of interesting case studies from diverse contexts (including Sri Lanka, Hong Kong and Japan) that highlight the potential tensions that can arise when different ways of understanding mental health are juxtaposed. So tell me about the Global Mental Health approach. It’s concerned with inequities in mental health provision across the globe, and it provides opportunities to work collaboratively with local stakeholders to generate innovative, pragmatic and culturally appropriate approaches to mental health and wellbeing. GMH-related activities have to date predominantly focused on building capacity in low- and middle-income countries (LMIC) where financial resources for supporting mental health tend to be very limited. With over 80 per cent of the global population living in LMIC, this is clearly a crucial area of activity. But GMH also has much to offer mental health services in high-income countries. In particular, there is a need to build capacity and tailor interventions to meet the needs of underserved populations such as minority ethnic groups, those living in deprived areas, and homeless people. I guess this is a bit of a minefield, in terms of power dynamics and the potential for accusations of ‘neo-colonialism’. Of course. A chapter in the book by Charles Watters (no relation to Ethan!) discusses the risk of ‘epistemic violence’ occurring when knowledge about emotional and psychological difficulties is shared across different cultural contexts. Preconceived notions of what is credible or legitimate can lead to the emergence of power dynamics that unduly subjugate particular ways of understanding and addressing distress. Similarly, Miranda Fricker has talked about the concept of ‘epistemic injustice’, where people are wronged in terms of their capacity to be knowledgeable about topics, or they are denied access to social resources that would help them make sense of their experience. It’s essential we recognise the biases and dominant paradigms in our training, research and practice. For me, a metaphor that captures the principal concerns of GMH is one I refer to as ‘flows of knowledge’. GMH provides crucially important opportunities to explore factors that facilitate, or block, the flow of particular forms of knowledge about emotional and psychological difficulties. The meeting of particular confluences of knowledge may help create opportunities for fertile ground on which impactful work can grow; equally, however, there’s a risk that particular flows of knowledge may not be sufficient to sustain the growth of forms of support that people in a particular context can engage with and benefit from. There are key ‘nutrients’ that can support people experiencing mental health difficulties the world over; such as working within people’s frames of reference, respecting their human rights, addressing social determinants of difficulties, helping people to find meaning in their experiences, supporting individuals to connect with what matters to them and minimising stigma associated with people seeking support. Our Handbook gives the reader insights into these nutrients. This does seem to go beyond the idea of ‘culture-bound syndromes’, which has perhaps been a bit of an ‘old curiosity shop’-type approach to mental health? Let’s talk instead of ‘cultural concepts of distress’, which incorporate the cultural/linguistic ways in which distress is communicated, and the explanations people use to understand its cause. And let’s also acknowledge that many psychiatric diagnoses are themselves ‘cultural bound syndromes’ of the West! Such an approach serves to acknowledge the significance and value of local forms of understanding of emotional and psychological difficulties. Making comparisons across different cultural contexts can pose particular challenges. Edward Said, the founder of postcolonial studies, coined the term ‘orientalism’ to capture the patronising attitude that people in the West can adopt to beliefs and practices in the East (i.e. Middle Eastern, South Asian, and East Asian cultures). Equally, however, we need to be wary of a ‘preservationist’ approach where ways of understanding and responding to distress in unfamiliar cultural contexts are considered to be sacrosanct and beyond critical interrogation. There’s also a risk of ‘ethnocultural acquiescence’, where because people are not from a particular cultural group, and lack sufficient understanding about the nuances of how distress may manifest in this group, they then assume they are not in a position to help. People can make an important contribution irrespective of where they come from – the attitude that people bring to this work will be key. Richard Horton has suggested that the field of global health has ‘built an echo chamber for debate that is hermetically sealed from the political reality that faces billions of people worldwide’. Do you agree? Horton was highlighting that armed conflict, forced migration and fragile economies bring social chaos to multitudes of people’s daily experience, and that too often this reality was not being acknowledged in efforts to build health service capacity across the globe. 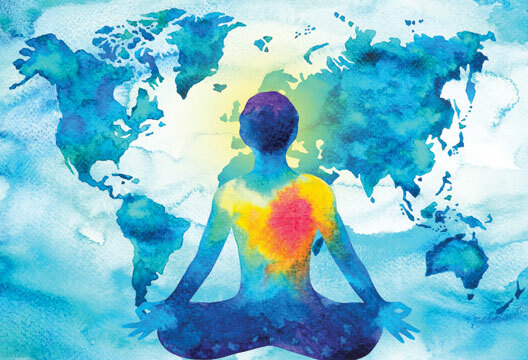 And many of us share the concern that efforts to build capacity for physical and mental health problems were out of step with the dire social and political circumstances in which people across the globe live their lives on a daily basis. But in recent years there’s been a growing recognition of the important role that social circumstances play in the emergence of both physical and mental health problems. For example, in 2014 the World Health Organization published a report entitled Social Determinants of Mental Health, and the Sustainable Development Goals (SDGs) published by the United Nations in 2015 make specific mention of physical, mental and social wellbeing. Just this year, one of our authors, Crick Lund, published a ‘systematic review of reviews’ in The Lancet Psychiatry which highlights how hugely relevant the SDGs are for addressing the social determinants of mental disorders, and how these goals can be honed to support prevention. All of this emphasises the important contribution that psychosocial interventions can make. The Mental Health & Psychosocial Support Network have a great online platform highlighting examples of this work. Yet the ‘treatment gap’ – between mental health needs and what is available on the ground – remains, and it’s greater in low-income countries. What’s the answer? More treatment, or more prevention and a focus on natural resilience and recovery? It’s important to critically reflect on the possibility that the concept of the ‘treatment gap’ rests on a rather restricted view of what constitutes ‘treatment’. Perhaps what we are actually referring to is a ‘mental health service delivery gap’? Rather than accessing medical treatments which may be unavailable or deemed not to be relevant, people living in LMIC routinely seek support from practitioners such as traditional healers, faith healers, community elders that tend not to be recognised as ‘treatments’. Yet a systematic review by Gareth Nortje and colleagues concluded that traditional healers might be helpful for relieving distress and improving symptoms associated with common mental disorders such as depression and anxiety. So, rather than rushing to create new systems that people may not engage well with, it will also be important to work in collaboration with practitioners that people routinely access and potentially derive benefit from. So often these issues come back to cost and capacity. Agreed, so a key strategy in GMH relates to ‘task-sharing’ roles to non-specialists. This is a pragmatic approach to the lack of highly trained professionals. Section 3 of the Handbook includes a range of case studies that provide examples of innovative and pragmatic initiatives to build capacity in a range of diverse LMIC in Sub-Saharan Africa, Asia, Australasia and Latin America. Some of the case studies provide examples of initiatives that aim to promote mental health and wellbeing, as well as those that aim to prevent emotional and psychological difficulties emerging in the first instance. It is an interesting time for psychology as a discipline. Frameworks such as ‘Power Threat Meaning’, and formulation-based approaches more broadly, offer great utility for understanding the relevance of contextual factors on the difficulties that people are experiencing. And as a discipline we have expertise in a range of research methodologies that are highly relevant to GMH. We have expertise in a range of inter-sectoral contexts (including educational, criminal justice, occupational settings) that are crucially important for promoting mental health, as well as preventing and treating mental health difficulties. There is some great work being undertaken by psychologists in the context of GMH and we hope that the book helps to highlight this. But there are also rich opportunities for diverse disciplines – such as psychology, psychiatry, sociology, and anthropology – to engage constructively with each other. In particular, I think that there are potentially productive collaborations to be forged with anthropologists. I loved that section of case studies of innovative practice and policy. If you had to pick a favourite, which would it be? The chapter by Chris Underhill and colleagues, reflecting on the work of the NGO BasicNeeds, demonstrates how adopting a ‘development model’ focused on improving the socio-economic standing of communities in LMIC can have marked impacts on the mental health and wellbeing of people living in these communities. Lucy Gamble’s chapter about her work with Transcultural Psychosocial Organization Cambodia reflects on the challenges that clinical psychologists who have been trained in high-income countries can face when working in LMIC. And Corinna Stewart and colleagues’ chapter detailing the work of the NGO ‘commit and act’ in Sierra Leone is personally salient to me. I’ve visited the country on three separate occasions to support the charity’s efforts to build capacity for supporting the mental health needs of the Leonean populations whose lives have been affected by civil war and Ebola virus disease. You mentioned earlier that high-income countries can learn a lot from Global Mental Health. Can you provide some examples of this? Too often ‘community approaches’ in high-income countries are actually a bit of a misnomer. Rather than bringing community members together, these initiatives tend to focus on finding ways to access individuals in more efficient and cost-effective ways. I have been fortunate to collaborate with colleagues at the University of Rwanda, Kigali, and to learn about approaches that have been used in the country to engage with local communities. Rwanda is a small but densely populated country of around 12 million people in East Africa. Mental health services in the country are underresourced and tend to be focused in urban areas. Many readers will be are aware of the traumatic recent history that Rwanda has endured – approximately one million people were killed in a 100-day period during the genocide that occurred in 1994. As you can imagine, the conflict that ensued between the Hutu and Tutsi people created considerable schisms in the social fabric of the country. Over the last 15 years a group-based intervention called ‘community based sociotherapy’ (CBS) has been disseminated throughout the country to help facilitate reconciliation and conflict transformation. During the 15-session intervention, group members are facilitated to focus on phases of safety, trust, care, respect, new life orientations and memory. The social space of the group is governed by principles including democracy, equality and confidentiality, aiming for group members to regain their capacity to relate and connect to others, so that they can experience again the vitality of humanity and feel mentally healthy. Evidence indicates that CBS has been effective for reducing distress in post-genocide Rwanda. Of course there are unique circumstances around the Rwandan context, but I think there are aspects of the CBS approach that could be relevant to high-income countries… particularly further exploration of how community members can work collaboratively to enhance their mental health and wellbeing. How can we get word out? Is training the key? Yes, and it’s unfortunate that the training resources available to applied psychologists in LMIC are often at odds with the cultural contexts in which they undertake their work. Key textbooks tend to have been written by authors from Europe and North America, influenced by paradigms and assumptions that are less familiar and/or less relevant to work in LMIC. We must tailor training resources to fit with local beliefs, practices and linguistic expression; work with government agencies to raise awareness of the valuable contribution that psychology can make; and explore ways of task-sharing psychological skills to non-specialists. There must have been all sorts of challenges in putting a book of this scope together. In putting the Handbook together, I – along with my fellow editors – wanted to ensure a range of diverse disciplinary perspectives were represented. Understanding of distress has evolved according to time, place, societal influences and epistemic perspectives – so the humanities (e.g. history, geography, philosophy and anthropology) are central to GMH, yet these disciplines have not been well represented in GMH texts. We also made a concerted effort to involve people from LMIC and people with a lived experience of mental health problems. Thankfully, the majority of the people we asked were able to commit to making a contribution, although inevitably there were exceptions. We’ve ended up with a book that is over 800 pages long, with 36 chapters, so we’re grateful to all those who give their time and effort so generously to complete such a mammoth project! - Read more from Ross White on the globalisation of mental illness.